River deltas are known for their dynamic nature. Most of the rivers naturally carry silt that eventually enters the ocean and settles at the bottom, continuously changing the shape of the seabed. Seasonal events, such as freshets - when glaciers’ snowmelt enters the river stream - are the time when the seafloor at deltas can change rapidly causing events called “slope failures” or “subsea landslides”. Fraser River delta is one such location where subsea landslides occur regularly, in particular during the spring freshet season (May-June). 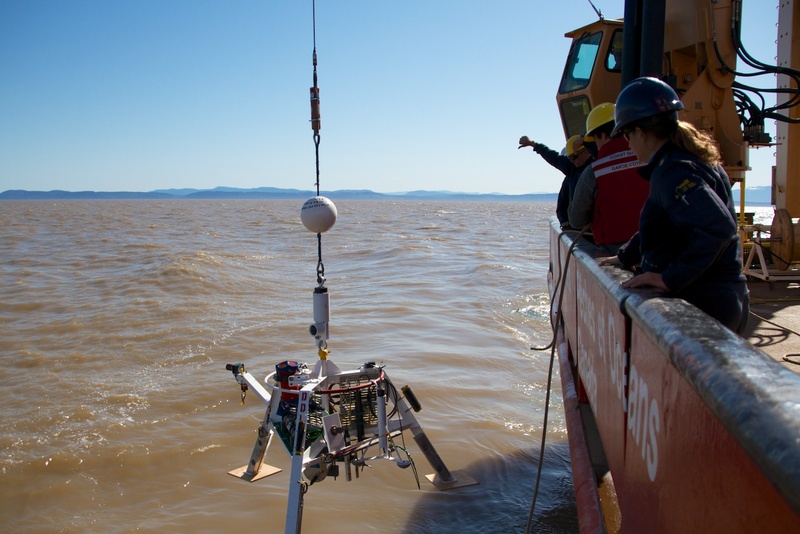 Natural Resources Canada leads several research programs studying seafloor processes and conducts regular surveys of the delta area. 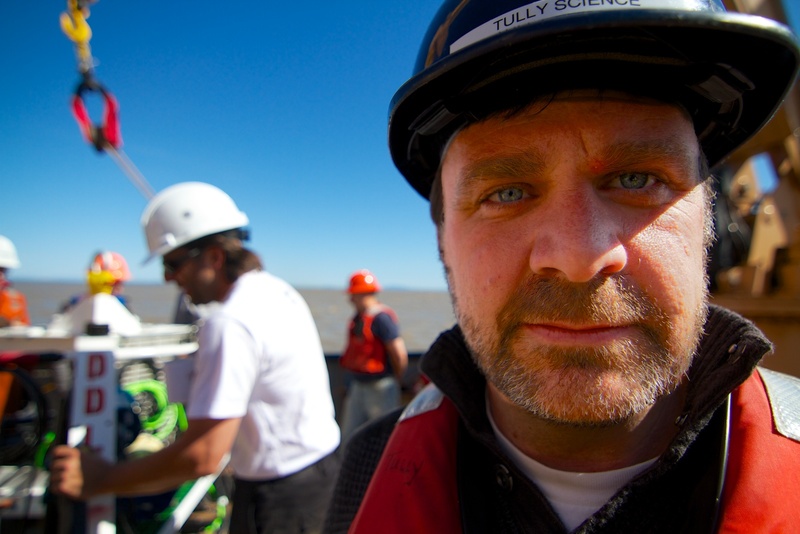 Coastal communities and infrastructure surrounding the southern Strait of Georgia would be at risk in the case of a submarine slope failure on the foreslope of the Fraser River delta and, therefore, scientific programs are essential to better understand seafloor processes. The monitoring of the slope stability is accomplished by measuring pressure beneath the seabed and failure events using custom-designed instruments. In the past, it has been difficult to measure and capture these relatively infrequent failure events by using short term moored instruments. Deployment and networking of the present instrument packages is facilitated by Ocean Networks Canada's Salish Sea Observatory. The observatory runs a fibre-optic cable in the Strait of Georgia allowing real time observations. Communication and power provided by the observatory allows scientists to measure key parameters in great detail and for long time periods (milliseconds to years). The goal of the monitoring program is to gain a better understanding of the conditioning factors and triggers of slope failure, and to develop instrumentation for monitoring these. Eventually this knowledge and instrumentation could be used to develop early warning systems for large and destructive failures in places where they are known to occur. The technology of measuring all variables at all time scales is essential, as some of the conditioning mechanisms can take months to years to form, yet the triggers and slope failure take place over just a few seconds. In 2008 the Delta Dynamics Laboratory (DDL) was placed on the upper slope of the delta. In both June and July 2008 between 20 and 40 cm of the seabed disappeared from beneath the delta dynamics lab. On the same weekend (same tides) five years later, the delta dynamics lab, now located at the bottom of the slope, was plucked off the seabed and sent tumbling. As it tumbled it measured in great detail the leading edge of the gravity flow which carried it downslope. One of the factors which leads to slope instability is simply fast build up of sediment on a delta front from river deposition. Profilers on the delta dynamics lab show this beautifully as a cascade of sediment which settles from the surface plume during slack tides. It gathers into thick muddy concentrations at the bottom over the next couple of hours. The variety of factors involved in generating slope failures at the Fraser Delta has made investigations difficult. A number of researchers with different expertise have made use of many different classes of instruments over the past two decades. The Seismic Liquefaction In Situ Penetrometer (SLIP) instruments include piezometers to measure pressures, in the water column and within the bed. These penetrate to a depth of 5m beneath the seafloor, at water depths down the delta slope between 10m and 140m. Prototype SLIP instruments have been deployed in this area during survey cruises, with the first fully deployed SLIP deployed in 2013. Accelerometers measures seismic activity, and along with inclinometers, measures associated movements (strain). Seasonal groundwater flows are measured by the combination of piezometers and thermistors. In addition to the SLIP instruments, there is a Delta Dynamics Laboratory (DDL) and a mini-node, which provide additional environmental information for the slope stability work as well as on general delta (sediment) processes. The delta mini-node at the base of the slope provides hydrophones to listen for landslides and earthquakes. The DDL contains mainly standard oceanographic instruments, including: a CTD to measure water properties, optical backscatter sensors to measure sediment transport at two different heights, single point current meters to measure currents at those same heights, upward looking ADCP to measure currents and sediment concentrations throughout the water column, acoustic profiler to measure sediment concentrations and gas bubbles (as well as zooplankton and fish) throughout the water column, scanning sonars to measure bedforms, and a laser instrument for measuring suspended grain sizes and concentrations. Ayranci K., Lintern G.D., Hill P.R., Dashtgard S.A. 2012. Tide-supported gravity flows on the upper delta front, Fraser River Delta, Canada. Marine Geology. v.326-328, p. 166-170. Lintern D.G., Hill P.R. 2010. An underwater laboratory at the Fraser River delta. EOS, Transactions, AGU 91 (38): 333-44. Hill P.R., Conway K., Lintern D.G., Meule S., Picard K., Barrie J.V. 2008. Sedimentary processes and sediment dispersal in the southern Strait of Georgia, BC, Canada. Marine Environmental Research 66: S39-48. Lintern D.G. 2008. Connecting with the Strait of Georgia – an overview of activities supported by NRCan using the VENUS project. Abstract. Geophysical Research Abstract Vo.10, EGU2008-A-11537. Lintern D.G., Hill P.R., Conway K. 2008. Using the VENUS underwater network to assess conditions leading to slope failures. In Proceedings of the IV the Canadian Conference on Geo-hazards: from causes to management. (Eds), Locat J. et al. Presse de l’Universite Laval, 594 p.